Few whitewater rafting trips anywhere on earth offer as much continuous, explosive whitewater as Idaho's Lochsa River* (pronounced Lock-Saw). 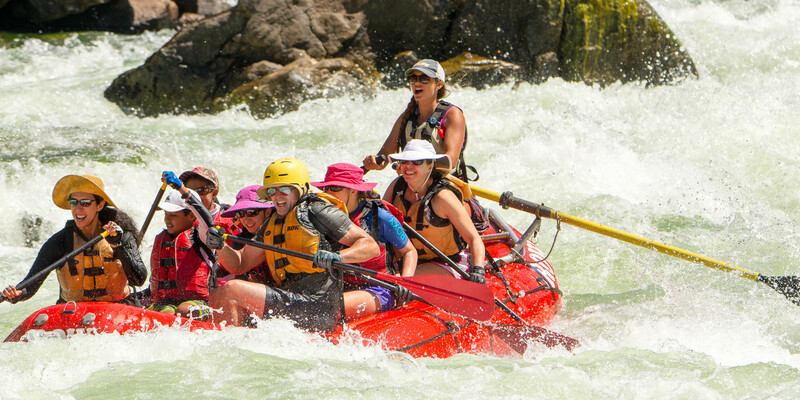 This one to three day rafting trip is big white water that satisfies the appetite for thrills for intermediate and expert rafters. Some rivers are big and slow while others are fast and technical. The Lochsa combines the best of both – it’s fast, technical and has a big volume of water. This makes for raft-smashing waves, big hydraulics and holes, and paddler-bashing excitement. Add supreme Idaho mountain scenery, talented guides and great service and you have the best whitewater rafting trips on the Lochsa River available. "The three rivers in the Route 12 corridor are designated Wild and Scenic, a federal protection, and they live up to the name. The Lochsa, which means Rough Water in the Nez Perce language, is ferocious and explosive white water, for hard-core rafters. The major stretch has more than 40 significant rapids. By that I mean, bumps with names, bumps that are the focus of many a rafter's dreams. One night in May over dinner at a river rat hangout, (River Dance Lodge in Syringa, Idaho) a couple of guides showed me photos from a busy day on the Lochsa. Every frame was solid froth, with a bouncing raft in the middle of it. " From its headwaters in the Bitterroot Mountains to its confluence with the Selway and Clearwater rivers, the Lochsa River pounds and churns through more than 40 major rapids. The Grim Reaper, Bloody Mary, Ten Pin Alley, Mile Long and the incomparable Lochsa Falls are just a sampling of rapid names on this exciting whitewater river trip. The white water rapids on the Lochsa are exceptionally long and frequent. Our ROW Adventures guides have guided around the world but for most the Lochsa remains their favorite heart-pounding whitewater trip! Every spring they return to be on the mighty Lochsa and share the fun. The Lochsa River is free-flowing and rafting trips begin as the winter snow begins to melt. Rafting season on the Lochsa begins in early May and goes until the water gets too low for rafting, typically mid-July to early August. Because there are no dams to artificially control the flow of the river, the river’s flow follows a bell curve, starting out low in the early spring, reaching its peak in late spring and then gradually dropping into the summer. It all begins sometime in April as warmer spring days start to melt the high-mountain snow. This brings the river level up and the Lochsa season begins. By mid-May temperatures are warmer than they were in April and consequently, more snow melts. This brings the river’s level up higher. May 15 to June 15 is generally the time of peak flows on the Lochsa. After June 15th the river levels begin to gradually taper off. Bear in mind that every year is different and flows depend on how much snow is in the mountains and whether or not we have a cool, wet spring or a warm, dry spring. There are many variables that make any exact predictions impossible. But over the decades that we’ve been running the Lochsa, peak flows are usually from May 15 to June 15. Does this mean that this is the “best” time to run the Lochsa? Not necessarily. The answer depends on what you are looking for. Those with previous rafting experience who are seeking maximum thrills will want to join us during this high water season. Others may prefer those times when the river is somewhat lower, the weather is warmer and the technical challenges of the river increase. After mid-June, as the water drops, more and more rocks and boulders become exposed creating some of the most challenging technical whitewater rafting in the country. It requires extra finesse and skill to guide the rapids at this time of year. Temperatures also increase warming the water and making for beautiful summer rafting days. As we approach early July the river becomes even more technical. We run the Lochsa every year as long as we can and this will vary, depending on the winter snows and spring weather. In general we go until about July 10th. Some years we have to stop earlier and on other years we’ve run until July 20th or so. Even at lower flows the Lochsa knocks the socks off most other rivers in terms of exciting whitewater. Note that we have minimum age recommendations. If you are a family with teenagers, join us after June 15th when the river isn’t quite so big and the weather is warmer. You’ll still find this to be one of the most exciting whitewater trips in the world! The Lochsa River was one of the original six rivers protected by the U.S. Congress in 1968 as part of the Wild and Scenic Rivers Act, in part because it is one of the world's greatest whitewater trips. If you've ever rafted West Virginia's Gauley or California's Tuolumne, compare these to the Lochsa and you'll find a new pinnacle of whitewater rafting excitement. Lochsa whitewater rafting adventures begin and end at the River Dance Lodge, Idaho's Outdoor Adventure Resort. Situated along the banks of the Clearwater River and surrounded by spectacular Rocky Mountain scenery, the River Dance Lodge is the perfect all-inclusive vacation resort if you're looking for a weekend getaway to go with your Lochsa whitewater trip. Package pricing is available. ROW Inc., doing business as ROW Adventures, is proud to be an Equal Opportunity recreation service provider under permit from the U.S. Forest Service. We operate under special use permit form the Clearwater National Forest. All our operations and facilities are operated on a non-discriminatory basis. ROW Inc. is bonded and fully licensed by the State of Idaho Outfitters and Guides Licensing Board. Choose a 1-day 20-mile trip, a Super 1-Day 30-mile trip or a 2-3 day adventure. Join ROW Adventures, the most experienced outfitter on the Lochsa for the best whitewater on earth! Only outfitter who has glamping tents! No other Lochsa company has more knowledgable guides ready to share their stories of the regions natural and cultural history. Hands down, best lunch on the river! We are the FUN rafting company...why would you go with anyone else? Departures: Daily May 24 through July 7; Dependent on water levels. Excludes Saturdays.